Are there any empirical reasons why Fox News receives overwhelmingly high viewership as compared to other news organizations? Fox news viewers are quite elderly, average age of 68 as of 2017. Older people consume news and media primarily through their TV and newspapers. Younger people more through their PC and smartphones (source). With younger people moving away from TV, that means a larger proportion of the TV watching audience will be elderly and elderly people tend to be more socially, politically and economically conservative (source). So with a graying TV news audience, it's no surprise that conservative news media would proportionately do better than centrist or liberal news media. People seeking a more left wing perspective have abandoned mainstream TV news and tend to go to specific YouTube channels or news websites (Democracy Now, the Intercept, The Real News) rather than tune in at 9 o clock to hear what Wolf Blitzer, Jake Tapper, Rachel Maddow, Anderson Cooper, Clare McCaskill or John Kasich has to say. Because there is only one Fox News and there are multiple competitors. Overall, CNN and MSNBC together are watched more than Fox (source). But they split the liberal viewership. So if they get 34% and 21% of overall viewership and Fox gets 45%, Fox is the most watched single network even as it is a minority of the overall market. If someone started a serious competitor for Fox viewers, that could reduce Fox's share. Or if MSNBC went out of business, most of their watchers would probably go to CNN. But as it is, they split the liberal market while Fox has the conservative market to itself. Pew: Partisanship and Cable News. Pew: Political Polarization & Media Habits. A recent(ish) poll of American TV viewers conducted by Brand Keys showed that an overwhelming majority of Americans surveyed (representing those who watch a Network channel at least three times a week) rated Fox News as far and away their most trustworthy source of information out of the major American news networks. It stands to reason that viewers would be less likely to watch news on networks that they rate as less trustworthy and more likely to watch news on networks that they consider more trustworthy. It may also be instructive to note that trustworthiness ratings seem to mirror actual viewer ratings. Fox News was ranked the “most trusted” American TV news brand in the United States, and was second overall, behind only the British-based BBC, according to a new study. 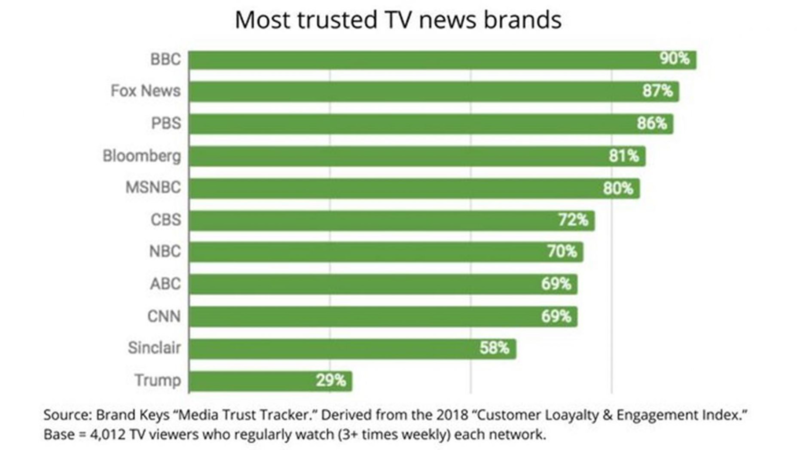 The Research Intelligencer study, conducted via Brand Keys, analyzed 4,012 viewers who rated both broadcast and cable news organizations that they watch at least three times per week to determine how those brands resonated from a trust standpoint. Ninety percent of the viewers surveyed said they trusted the BCC, with 87 percent saying they trusted Fox News. PBS finished third with 86 percent, followed by Bloomberg and MSNBC, to join BBC and Fox News among the five most trusted TV news brands, according to the study. The three major broadcast are listed next, with CBS’s 72 percent topping both NBC and ABC. Not the answer you're looking for? Browse other questions tagged united-states media or ask your own question. Is Wikipedia politically even-handed in its coverage of US cable news channels? How are news made in western mainstream media? Why have many organizations not called some states yet? Why is Medicare/Medicaid prohibited from bargaining for price in US?